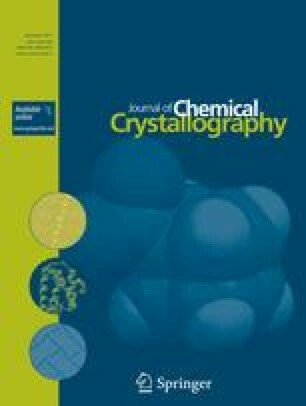 The preparation and characterization by X-ray crystallography and NMR spectroscopy of the 2,2′-dipyridyl-N-methylimine (dpNmei) and the complex [cloro-bis(N,N′-2,2′-dipyridyl-N-methylimine)]lithium [Li(dpNmei)2(Cl)] is reported. The dpNmei was prepared from the reaction of the 2,2′-dipyridyl ketone (dpk) and methylamine and crystallizes in the monoclinic P21/n space group with a = 6.3887(6), b = 10.1709(10), c = 16.7594(17) (Å), β = 100.918(2)∘ and V = 1069.29(18) Å3. The lithium complex was obtained from the reaction of dpNmei and LiCl in a molar ratio 2:1. [Li(dpNmei)2Cl] crystallizes in the orthorhombic Pbcn space group with a = 10.0092(12), b = 9.8201(12), c = 23.669(3) (Å) and V = 2326.4(5) Å3. The crystallographic data show that the lithium ion is five-coordinated with four coordination bonds N→Li due the chelation of dpNmei and one Li–Cl bond.